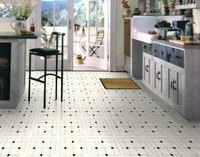 Tiled floors are a decorative way to add color and style to a room. Easy to maintain, these floors are always a popular choice for style and manageability. Maintaining and keeping these floors clean is essential not only for esthetic reasons, but sanitary ones as well. Bleach is well known to be highly effective in killing germs, and it can be useful in cleaning your tile floors. The process is simple, yet time consuming, and worth the efforts in the end. Sweep the floors completely to remove all loose dirt and debris. It may also be helpful to dust mop the floor as well. Mix a solution of two parts water and one part bleach in a bucket or in the sink. If your tiles and grout aren't white, use color-safe bleach to avoid fading and discoloration. Dip a soft to medium bristle brush in the solution and use it to clean the grout in between the tiles. Mop the flop with a mop dipped in the solution. If the area is small, it may be beneficial to use a soft clean cloth or towel instead of the mop to be able to do a more thorough job. Allow the floor to dry completely and do any touch ups as needed. Wear gloves and ventilate the area well when dealing with bleach.